Most business people are finding that despite all the technology, there’s still no substitute for face-to-face contact and networking. That’s why conferences, exhibitions, seminars and networking events are such a valuable way to find new business contacts or strengthen existing relationships. Business cards are an absolute must for any business event. And if you’re organizing conferences or exhibition stands, custom ring binders and sticky posters can make a lasting impression on delegates, guests and contacts. Here are some of the ways you can make them work for your business. At Avery WePrint, we know that your business card is representing you and your company, so we place great importance on quality. The card material we use is thick and sturdy at 340 gsm. And we’ve spent many years perfecting printing techniques to give a highly professional and premium look. When it comes to designing your business cards, the first question is whether to go for a standard or square shape. While square business cards can help you stand out, a standard size may fit more neatly into business card holders. But with more and more people now scanning business cards (more on this below) non-standard shapes can be less of an issue. At Avery WePrint, we provide a choice of standard business cards: 85mm x 55 mm or a slim version 90mm x 50mm. Square business cards are 60mm x 60mm. You can have them printed on one or both sides. If you want to put some additional information about your company on your business cards, choose the folded cards (available for standard or square) to double the space available. We all know how dog-eared business cards can get if left loose in pockets, bags and brief cases! At Avery WePrint, we’ve developed unique business card pads keep them all together, protected by a durable clear cover. And when you remove a card, the edge is perfectly clean! Have all the contact information on one side of the card. For contact details, use a standard font such as Arial, HelveticaNeue, Times New Roman or Verdana (all available on the Avery WePrint Design Tool) at least 10pt in size. Use a separate line for each phone number and email address and use a standard format for the address. 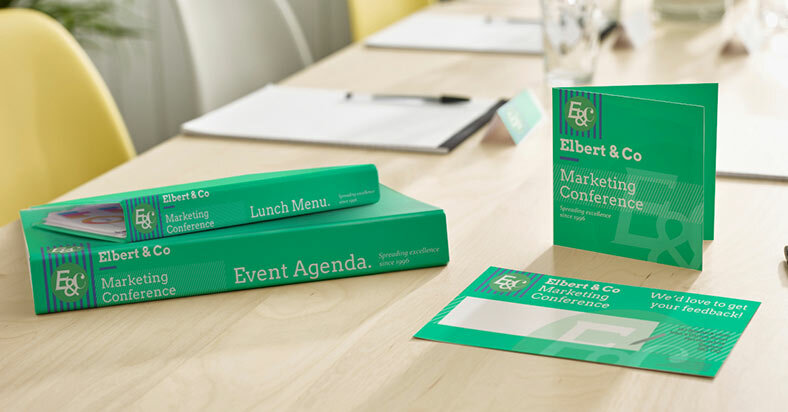 Whether you want to make an impression or boost sales, custom ring binders are perfect for keeping conference papers together and presenting sales pitches or company information. Having your logo, designs, words and colours on a high quality, durable, binder can produce a really stunning effect. You can choose a matt or gloss cover for your Avery WePrint ring binders. Gloss will give you a really sleek look as these covers are made from a type of plastic called polypropylene. Both types of cover are designed to be scuff-proof. Ring binders are for A4 or A5 size paper or inserts. 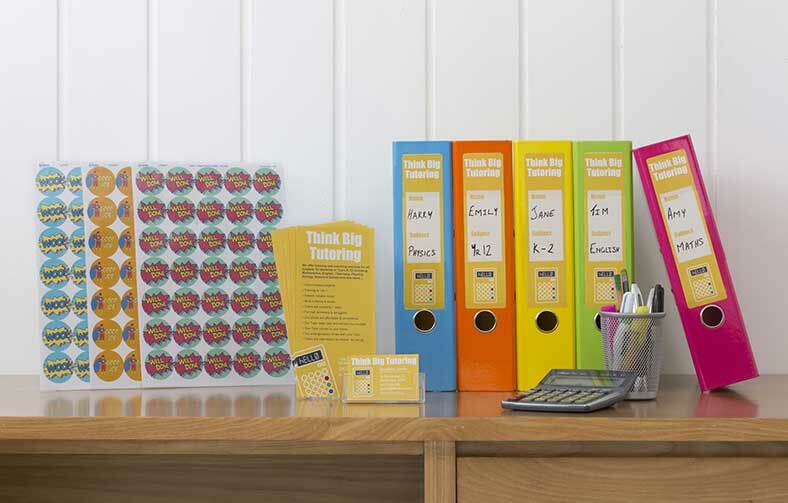 A4 ring binders go from 15mm to 50mm thick and you can choose a two or four ring mechanism. A5 ring binders are 15mm or 25mm thick and have two rings. Lever arch files are 65mm thick. Signage or wall stickers are essential for conferences and exhibitions. Not only can they help with directions, but they also allow you to create a highly professional, branded look showing logos, taglines, messages and images. Avery WePrint sticky posters are designed not to leave any sticky residue on the wall when you take them down. And we use photo quality digital printing and quality materials to enhance your design and make your sticky posters last longer. You can create sticky posters in round, square and rectangle shapes. Rectangular posters go all the way from A5 size (148mm x 210mm), through A4, A3, A2 and A1, to A0 size (841mm x 1,189mm or 33.1” x 46.8”). Round stickers are 350 mm in diameter and the square stickers are 400mm. We know just how tricky it can be to organise conferences, events and exhibition stands. So we’d like to wish you the best of luck. Do let us know how you get on by contacting us - call us on 0800 587 0878 or email us at weprint.uk@avery.com.